Haq's Musings: Did Pakistan Quake Release Methane Hydrate Gas to Form Island? Did Pakistan Quake Release Methane Hydrate Gas to Form Island? Pakistan is known to have significant natural gas deposits trapped in the form of methane hydrates in sedimentary rocks off the coast of Baluchistan. Tragic as yesterday's earthquake is in terms of loss of human life, it may also have triggered the release of substantial amount of gas which pushed up a new island in the Arabian sea. A team of scientists from the National Institute of Oceanography in Karachi will visit the site this week to investigate it. In a study published online in the journal Nature Geoscience and reported recently by New York Times, European researchers said that an underwater quake off Pakistan nearly 70 years ago likely fractured seafloor sediments and created pathways for the release of methane gas which still continues to bubble up from below. The researchers say the phenomenon may be widespread enough that climate scientists should take it into account when estimating the amounts of heat-trapping gases in the atmosphere. Dr. David Fischer, the lead author of the study, told New York Times: “The quake broke open gas-hydrate sediments and the free gas underneath migrated to the surface.” The hydrates themselves did not dissolve. “They remain there,” he said. While the existence of offshore methane hydrate deposits has long been known in many parts of the world, it's only recently that Japan demonstrated that natural gas can be produced commercially from such deposits. Methane hydrate is also known by other names such as methane clathrate, hydromethane or methane ice. This last name relates to the fact that it is an ice-like crystalline substance, basically, frozen methane. Methane hydrate is a naturally occurring phenomenon that can be found in soft sediments in Arctic environments. It can be extensively found in the uppermost few hundred meters of slope and rise sediments in continental margins where the right temperature and pressure conditions are present. Methane hydrates have been discovered on the Atlantic and Pacific margins of both North and South America, especially at equatorial latitudes. They are also found off the coast of Canada, Alaska, off the West coast of Norway, the Black Sea and off the coast of Pakistan. Smaller fields have been discovered off the coast of New Zealand and Antarctica, according to Oceaflores. One cubic meter of hydrate contains 164 cubic meters of gas, once the gas is released, it expands to more than 150 times the original volume. As a consequence, methane hydrate reserves are thought to contain more than twice as much fuel energy as all currently known fossil fuel reserves. Methane hydrate is not yet ready for prime time as a substantial source of energy. However, it could become commercially viable in the future for Pakistan if the Japanese succeed in their efforts. It could be another significant energy revolution similar to the shale revolution now unfolding in America. Pakistan is blessed with both-shale and methane hydrate-in huge quantities enough to fuel the national economy for a long time. Rare Earths at Reko Diq? That is what one of the scientist on NPR said. Ice --> Methane --> Pushed the land up. The head of the Geological Survey of Pakistan confirmed that the mass was created by the quake and said scientists were trying to determine how it happened. Zahid Rafi said such masses are sometimes created by the movement of gases locked in the earth under the sea, pushing mud and earth up to the surface in something akin to a mud volcano. "When such a strong earthquake builds pressure, there is the likelihood of such islands emerging," he said. "That big shock beneath the earth causes a lot of disturbance." To get a better idea of what the island is made of and how permanent it is, scientists will have to get samples of the material to see if it's mostly soft mud or rocks and harder material. He said these types of islands can remain for a long time or eventually subside back into the ocean, depending on their makeup. A Pakistani Navy team reached the island by midday Wednesday, navy geologist Mohammed Danish told the country's Geo Television. He said the mass was about 60 feet (18 meters) high, 100 feet (30 meters) wide and 250 feet (76 meters) long, making it a little wider than a tennis court and slightly shorter than a football field. "There are stones and mud," he said, warning residents not to try to visit the island. "Gasses are still emitting." It turns out that buried in the sediment offshore from Pakistan, there's a type of ice that's made mostly of methane. And it turns out that during earthquakes, this methane can sometimes be released from its ice form and turn into a gas. Japan says it has successfully extracted natural gas from frozen methane hydrate off its central coast, in a world first. Methane hydrates, or clathrates, are a type of frozen "cage" of molecules of methane and water. The gas field is about 50km away from Japan's main island, in the Nankai Trough. Researchers say it could provide an alternative energy source for Japan which imports all its energy needs. Other countries including Canada, the US and China have been looking into ways of exploiting methane hydrate deposits as well. Pilot experiments in recent years, using methane hydrates found under land ice, have shown that methane can be extracted from the deposits. Rashid Tabrez, the director-general of the Karachi-based National Institute of Oceanography, says the energy released by the seismic movements of these fault-lines activates inflammable gases in the seabed. "When the plates along the fault-lines move, they create heat and the expanding gas blasts through the fissures in the earth's crust, propelling the entire sea floor to the surface." The island that popped up near Gwadar is the fourth in this region since 1945, and the third during the last 15 years, he said. In the hours after the quake, a new island suddenly rose offshore in shallow seas near the town of Gwadar, about 230 miles (380 kilometers) southwest of the epicenter. Geologists with the Pakistan Navy have collected samples from the rocky pile, the Associated Press reported. From pictures and descriptions, many scientists think the mound is a mud volcano, which often erupt after strong earthquakes near the Arabian Sea. A second island has also been reported offshore of Ormara, about 170 miles (280 km) east of Gwadar, Geo News said. "Other mud volcanoes have been triggered at this distance for similar size earthquakes," Michael Manga, a geophysicist and expert on mud volcanoes at the University of California, Berkeley, told LiveScience's OurAmazingPlanet. But despite the hazards faced by millions living near the Chaman Fault, a combination of geography and politics means the seismic zone remains little studied. The Taliban killed 10 climbers, including an American, in northern Pakistan in June. "Its location is in an area that is very difficult to do any traditional field work," Khan told LiveScience's OurAmazingPlanet. "I tried twice to submit proposals to (the National Science Foundation) and I got excellent reviews, but the review panel said I was risking my life to work in that area." But the National Academy of Sciences felt differently. With their support, Khan and his colleagues in Pakistan and at the University of Cincinnati are now studying the fault's current and past movement. This will help the researchers forecast future earthquake risk. "This fault has had very little work and no paleoseismology," Khan said. "It is really important." Pakistan's deadly earthquakes owe their birth to the juncture of three colliding tectonic plates: Indian, Eurasian and Arabian. The Indian and Eurasian plates grind past each other along the Chaman Fault, triggering destructive temblors. Earthquakes along the Chaman Fault are more frequent in the north than in the south, Khan said. Similar to California's San Andreas Fault or Turkey's East Anatolian Fault, in some spots, the massive plate boundary is not a single fracture. 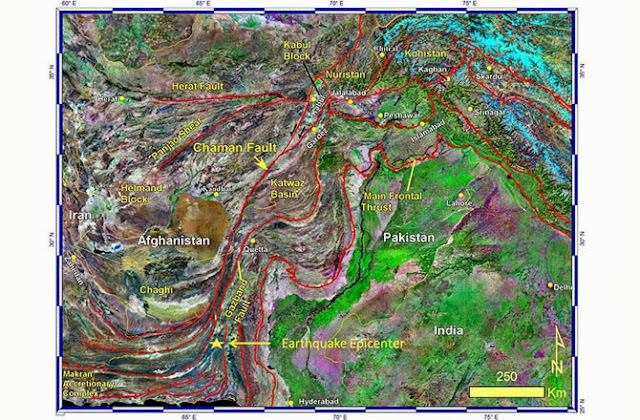 In southern Pakistan, the Chaman Fault splits into more than one strand, weaving a braid of many smaller faults. The differences between north and south influence the number of earthquakes. Altogether, the strike-slip Chaman Fault spans more than 500 miles (860 kilometers), crossing through Afghanistan and Pakistan. Strike-slip faults move each side of the fracture mostly parallel to each other. In the north, near the town of Chaman where India jabs a knuckle into Pakistan, the fault has zipped along at 33 millimeters (1.3 inches) every year for the past 38,000 years, according to a study Khan's team published Sept. 12 in the journal Tectonophysics. "That is very fast," Khan said. "That tells me there were multiple major earthquakes in the last 38,000 years.". Some have discovered a potential saviour, locked away under deep ocean beds and vast swathes of permafrost. The problem is it's a hydrocarbon, but unlike any other we know. Otherwise known as fire ice, methane hydrate presents as ice crystals with natural methane gas locked inside. They are formed through a combination of low temperatures and high pressure, and are found primarily on the edge of continental shelves where the seabed drops sharply away into the deep ocean floor, as the US Geological Survey map shows. And the deposits of these compounds are enormous. "Estimates suggest that there is about the same amount of carbon in methane hydrates as there is in every other organic carbon store on the planet," says Chris Rochelle of the British Geological Survey. In other words, there is more energy in methane hydrates than in all the world's oil, coal and gas put together. By lowering the pressure or raising the temperature, the hydrate simply breaks down into water and methane - a lot of methane. One cubic metre of the compound releases about 160 cubic metres of gas, making it a highly energy-intensive fuel. This, together with abundant reserves and the relatively simple process of releasing the methane, means a number of governments are getting increasingly excited about this massive potential source of energy. The problem, however, is accessing the hydrates. Quite apart from reaching them at the bottom of deep ocean shelves, not to mention operating at low temperatures and extremely high pressure, there is the potentially serious issue of destabilising the seabed, which can lead to submarine landslides. A greater potential threat is methane escape. Extracting the gas from a localised area of hydrates does not present too many difficulties, but preventing the breakdown of hydrates and subsequent release of methane in surrounding structures is more difficult. And escaping methane has serious consequences for global warming - recent studies suggest the gas is 30 times more damaging than CO2. These technical challenges are the reason why, as yet, there is no commercial-scale production of methane hydrate anywhere in the world. But a number of countries are getting close. The US, Canada and Japan have all ploughed millions of dollars into research and have carried out a number of test projects, while South Korea, India and China are also looking at developing their reserves. Pakistan’s exclusive economic zone has grown by 150 nautical miles, adding around 50,000 square kilometres of international waters to its territory. A United Nations commission has accepted Pakistan’s claim for extension of its continental shelf limits from 200 nautical miles to 350 nautical miles, according to a statement issued by the Pakistan Navy on Friday. “This adds over 50,000 sq kms of continental shelf to the existing 240,000 sq kms of EEZ under Pakistan’s jurisdiction,” its added. Pakistan now enjoys exclusive rights over the seabed and subsoil resources, allowing it to drill for petroleum or lay submarine cables or pipelines in the added area. Article 76 of the UN Convention on the Law of the Sea allows coastal states to extend their continental shelf beyond 20 nautical miles. However, the state is required to prove its case through technical data to the UN Commission on the Limits of the Continental Shelf – a body of 21 experts in geology, geophysics, hydrography and related disciplines. In 2005, the navy and the National Institute of Oceanography with the science and technology ministry had started this project. After years of processing technical data, a submission was made to the UN on April 30, 2009. A seven-member commission after over a year-long scrutiny, adopted the recommendations for extension of the country’s continental shelf. Pakistan’s delegation gave the final presentation on March 10. The UN has now announced the adoption of Pakistan’s claim. The navy statement termed the decision a landmark in the country’s history which would bring vast economic benefits through the exploitation of extensive natural resources. That tsunamis can cause death and devastation has become painfully clear over the past two decades. On Boxing Day, 2004, a magnitude 9 earthquake off the coast of Sumatra caused waves several metres high to devastate the Indian Ocean – killing more than 230,000 people in 14 countries. In 2011, another magnitude 9 earthquake, this time off Japan, produced waves up to 20 metres in height, flooding the Fukushima nuclear reactor. It killed more than 15,000 people. 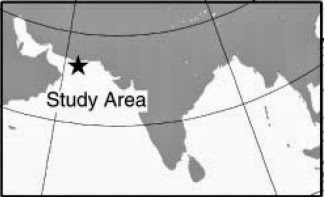 A new study, published in Geophysical Journal International, by my colleagues and me suggests that a 1,000km long fault at the northern end of the Arabian Sea may pose a similar threat. The Makran, as the southern coastal region of Iran and Pakistan is known, is a subduction zone. In such regions, one of the Earth’s tectonic plates is dragged beneath another, forming a giant fault known as a “megathrust”. As the plates move past each other, they can get stuck, causing stress to build up. At some point the stress becomes high enough that the megathrust breaks in an earthquake. This was exactly what caused the Sumatra 2004 and Tohoku 2011 earthquakes. When a megathrust moves suddenly, the whole seafloor is offset and the water has to move out of the way over a huge area. This sets off waves with particular characteristics that can cross entire oceans: tsunamis. The phenomenon, along with their potentially large size, makes subduction zone earthquakes particularly dangerous. But just because a part of a subduction zone produces earthquakes doesn’t mean that the whole megathrust can move in one go. We often see that stress builds up at different rates on different parts of the fault, with some parts sliding smoothly past each other. How much of a megathrust can move in one go is important because it determines the size of the resulting earthquake. The amount that the Makran megathrust can move in earthquakes has been a longstanding question, but the hostile climate and challenging politics of the region have made research there difficult. We know that the eastern part of the Makran megathrust (in Pakistan) can produce large earthquakes. A magnitude 8.1 quake off the coast of western Pakistan in 1945 caused a tsunami which killed about 300 people along the coasts of Pakistan and Oman. There have been several smaller earthquakes on the megathrust since, including a magnitude 6 in February this year. If the western part of the Makran (in Iran) also produces earthquakes – and the whole Makran megathrust were to move in one go – it could produce a magnitude 9 earthquake, similar to those in Sumatra and Tohoku. However, we have never actually recorded a subduction earthquake in this part of Makran. In fact, there are only records of one candidate quake from 1483 – and the actual location of this is disputed. But it’s important to keep in mind that just because we haven’t seen an earthquake doesn’t mean that there couldn’t be one – particularly since the intervals between earthquakes are often hundreds or thousands of years. Historically, not many people have lived in the remote Iranian Makran, a desert which killed Alexander the Great’s army. So earthquakes might simply not have been documented. Chairman Joint Chiefs of Staff Committee (JCSC) Gen Zubair Mahmood Hayat on Wednesday revealed that major gas reserves have been discovered along the Makran coast. Speaking at a conference in Karachi, Gen Zubair said Pakistan is blessed with minerals worth billions of rupees. A recent oceanographic survey conducted in the coastal belt discovered huge gas reserves, he told the audience in a QA session. 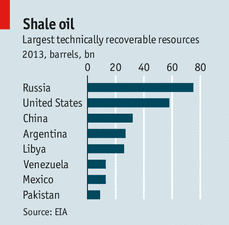 Pakistan is sitting on ninth biggest shale gas reserves, he further added.